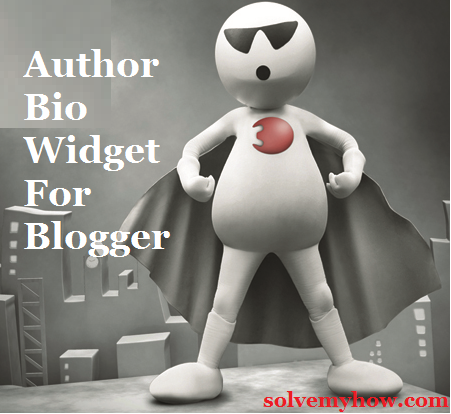 You might have seen that many bloggers are showing their profile at the end of the post and that thing is called author bio widget. Configuring this was very difficult long back, but recently blogger made some fantastic updates and this is one of them. So now if you are using the default blogger template then you just have to click on the checkbox to enable author bio widget in blogger. The one who doesn't use default blogger templates, have to make some changes in template portion. Don't worry SolveMyHow is one of them and in this tutorial, I'll cover both the parts i.e default and custom. Step 1 :- Login into blogger account. Go to blogger and simply login into it. Step 2 :- Go to layout >> edit body widget. In layout section, look for "body post" section and click on "edit". Step 3 :- Now a new window will be pop up. In that just find "show author profile below post" check box and just click on it or enable it. That's it you're done and now you will see author bio widget below each and every post. Wasn't it was simple ? Alright now lets configure the same thing for bloggers who are using custom templates. Step 1 :- Repeat the above 3 steps. Step 2 :- Go to template >> Edit HTML. PS. don't forget to take backup of your blogger template before editing. Step 3 :- Find "<div class='post-footer-line post-footer-line-3'>" in your blogger template. Simply press CTRL + F and copy and paste the above mentioned code. Step 4 :- Now paste the below mentioned code. Simply press 2-3 enters and copy and paste the code mentioned below. Step 5 :- Click on save. That's it. Just open your any of the blog post and check it. You will find author bio widget at the end of every post. Q) How does it works and what if we wanted to change the description ? Well it works very simple. It just fetched your Google Plus profile description and if your wanted to change it, you just need to change your Google+ description. How To Edit Blogger Author Profile ? Step 1 :- Go to google plus. Login into your account and go to your profile. Step 2 :- Click on "about" tab. Step 3 :- In story section click on edit. In store section you will find one "introduction" part, which is fetched by blogger so in order to change the author profile in default blogger author box, click on edit and change it. So, it be be automatically updated in your blog posts. How To Write Own Author Profile In Blogger ? 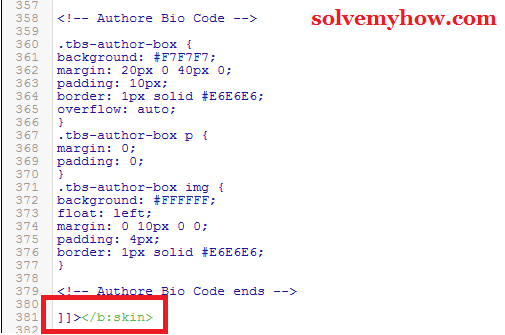 Step 2 :- Find " ]]></b:skin> ". Now just copy and paste the above code " ]]></b:skin> " in your template. Step 3 :- Press CTRL + F and find <data:post.body/>. Step 4 :- Copy and paste the code mentioned below. 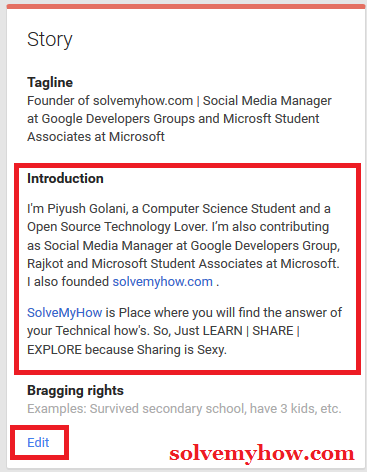 Piyush Golani is the owner of SolveMyHow.com and a young internetpreneur from Ahmedabad, India. He made SolveMyHow with one goal i.e solving people's how globally. He loves to read & write about Blogging, WordPress, SEO and Making Money online. Apart from blogging, he's also computer science student. Replace my name, image URL and description with yours. PS. it may happen that you may find multiple instance of <data:post.body/>. In my case it worked it first instance only but you can try all the instance if it doesn't worked with the first 1. How To Show Author Bio For Multiple Authors ? Are you allowing guest post on your blog ? or are you working in a group on single blog ? Then at that time you have too many authors right ? So, to write bio for each and every author, you need to add the above mentioned code as it is in your blogger template but by changing your name, image url and and description with his/her name and description. So, this was all about how to add author bio widget in blogger. 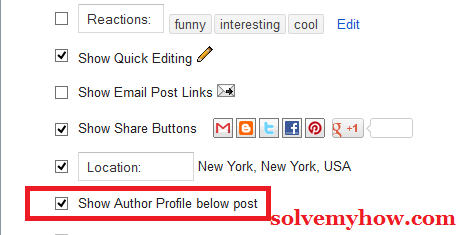 Hope this tutorial will help you in adding author box below your blog posts. From above mentioned techniques, which you like the most. Do let me know in the comments below. You can also subscribe for SolveMyHow newsletter to get blogging, SEO and make money online tips right into your inbox. Hi.. can you post how to improve followers in Twitter?